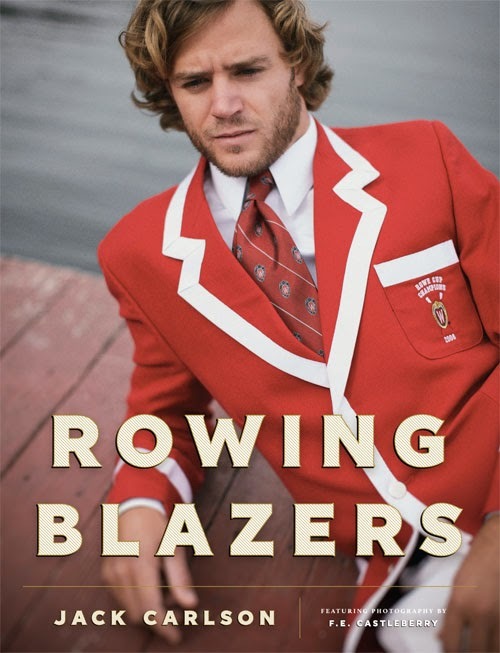 The cover of Rowing Blazers, the new book by Jack Carlson, and the living version, top, at the book party. It turns out that my friend George Carr knows Jack Carlson, the author of the new book from Vendome Press called Rowing Blazers, and so I was invited to the recent party to celebrate the book at the new Polo Ralph Lauren flagship store on Fifth Avenue and 55th Street. Also, I am now working at Ralph Lauren! Yes dear reader, I was offered a job as senior writer, special projects, in the internal creative agency at Ralph Lauren, and I most happily accepted. So I am very familiar with the gleaming new Polo store which offers the Polo brand for women that has just been introduced, as well as Ralph's Coffee, a charming coffee shop on the second floor. Check it out. 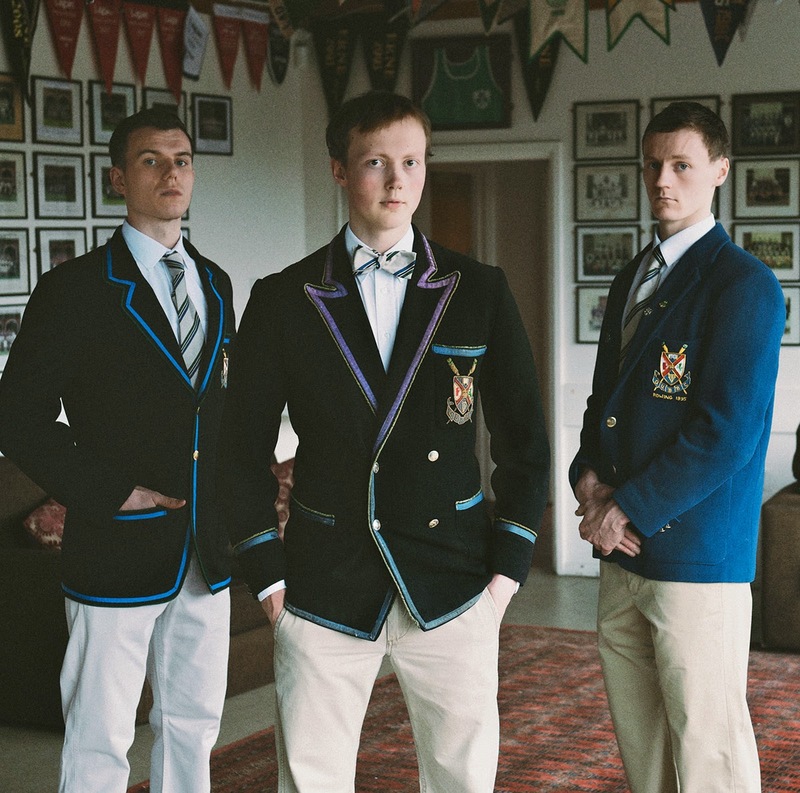 Rowing Blazers, with photographs by F. E. Castleberry, thoroughly explores the dapper blazers which boating teams have worn since the nineteenth century. The author Jack Carlson himself has rowed for Georgetown and Oxford, and his friends came out in droves for the book party which was already packed with rowers and their admirers by the time my friend Paul from work and I arrived. Sporting mates gathered together and moved throughout the party so there were crowds of color, like the fellows in red above, wherever you looked. It brought to mind the recent Ivy Style exhibit at F.I.T. At the party George Carr introduced me to Jack Carlson who told me that he is now studying for a Ph.D in archeology at Oxford. 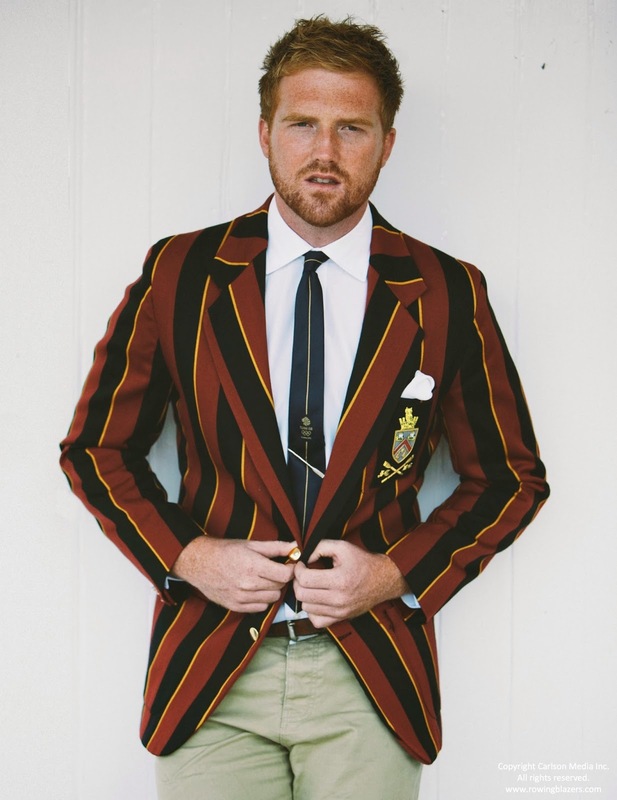 When I asked him what about the rowing blazer interested him, he said, "It's a combination of all the things I love – rowing and style and pageantry and history and heritage." 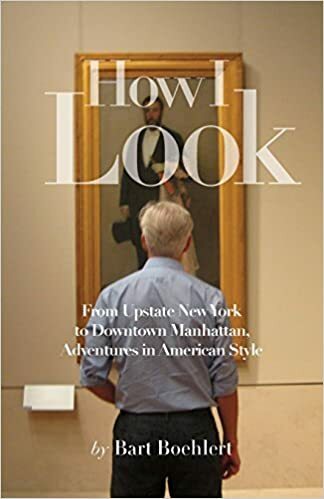 In his book, he explores the boating jacket which first came about at the end of the nineteenth century in distinctive contrasting colors so that spectators could identify the different teams as they rowed past. 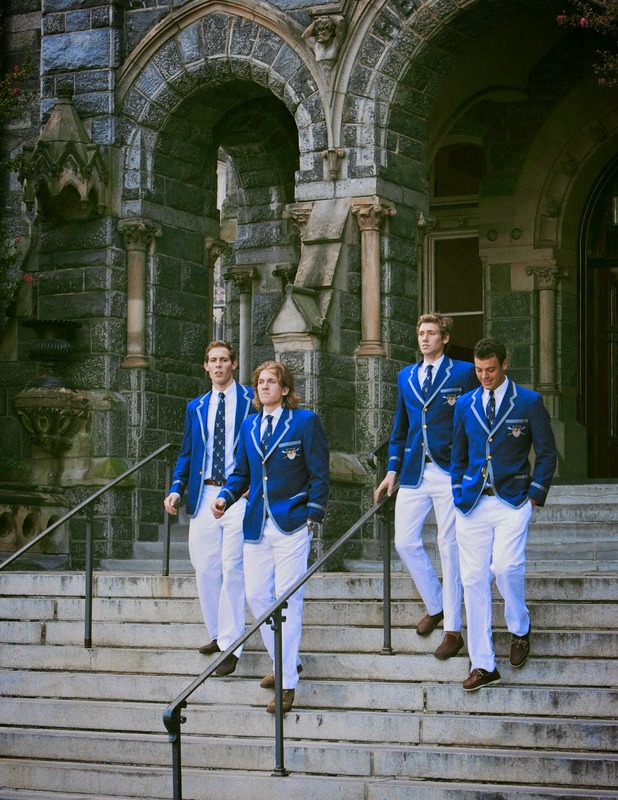 Rowing teams still wear their signature colors today, as illustrated in the book. I'm a big fan of these blazers which have a distinctly Edwardian feel; they look like they're right out of Downton Abbey. Once, at a vintage store in Montreal, when I was at college at McGill University, I bought a navy blue Bill Blass blazer with white piping. I wore that jacket all the time, with jeans and everything. The rowing jacket combines good health and exercise with a sophisticated, elegant line. 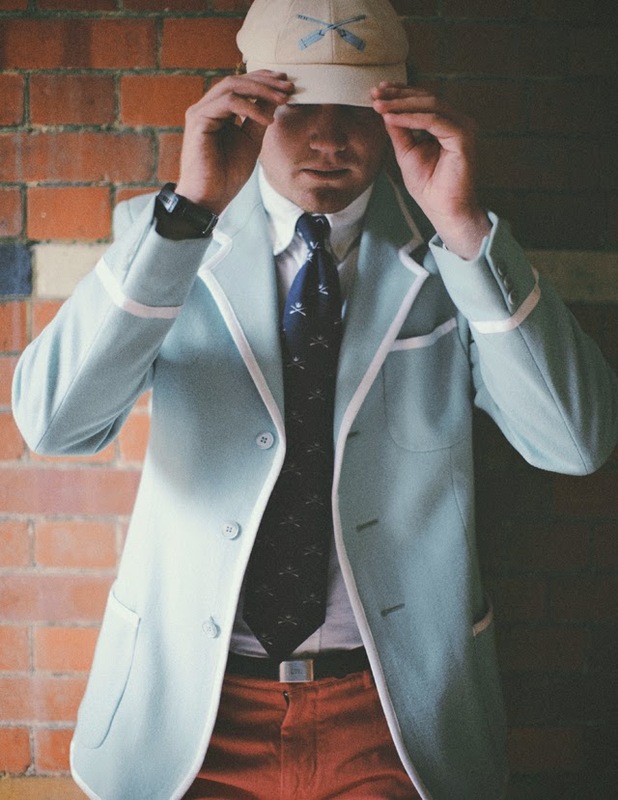 In one garment, the boating blazer captures the spirit of the sporting gentleman.